A great air hose is invaluable – but finding the perfect one can be tricky. As well as making sure you don’t buy a shoddy product, you also need to make sure that the air hose you purchase is the right type for the job that you’ll need it for. In this guide, we’ve covered everything you need to know in order to find yourself a great air hose that will last a lifetime. Whether you’ve picked up an air compressor that includes a cheap plastic hose, or if you’re old hose just isn’t the right one for the job anymore, we’ve got you covered. If you’re just looking for a brief table comparison between hose materials – Plews-Edelmann have a fantastic one here. If we only had to recommend one air hose to suit almost anyone – it would be Flexzilla’s ‘hybrid’ air hose, which you can find on Amazon here. These hybrid hoses, which we cover in detail later, are fantastic all-rounders. They’re light, flexible, and work just fine in almost any temperature. Their price is generally great value for money, and Flexzilla is a very reputable brand who are known for their durable products. Finally, that model in the link comes with a huge variety of sizes, lengths, and fittings – making it incredibly easy to just select the exact hose type and style that you need. Not sure exactly what you’re after? Then read on.. 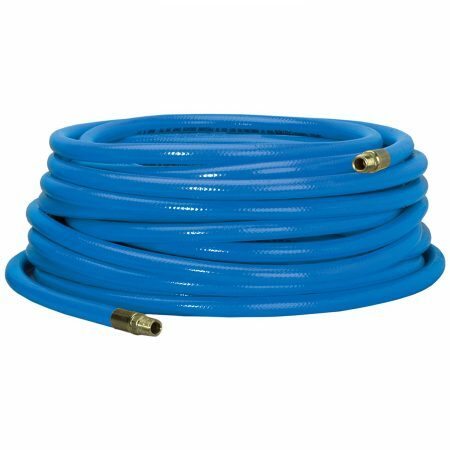 Which air hose is the best for me? There’s a lot of different types of air hoses out there- and just like Goldilocks, it’s important that you find the one that’s juust right. Rubber – heavy (doesn’t kink), easy to roll up, flexible, good in varying temperatures, fairly high cost. The traditional choice which still holds up today. PVC – cheap and light, it does tend to kink but not to a great deal. 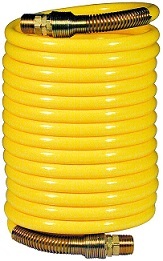 The standard hose type included with most air compressors. Bad in cold weather. Polyurethane – made to be a lighter and easier to use version of rubber, but kinks a lot and is expensive. Good for working on the move, bad for heavy duty / static working. Nylon – lightest option, kinks easily but can also be coiled up without much effort. Great for moving around, but not very long lasting. 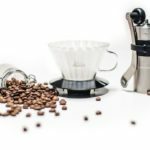 Hybrid – combinations of two or more of the above materials. Typically PVC and rubber, aiming for the best of both worlds. 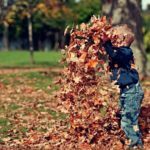 Since material is the biggest factor, we’ve written detailed reviews of each material type further below – alongside our top recommendation for the best hose of each type of material. Our quick recommendation in action – the light and flexible Flexzilla hybrid air hose. Air hoses generally come in 25, 50, or 100 feet lengths. You will lose a bit of power over a longer hose, though it’s not very significant. What does matter is where you’ll be working. Think about what you’ll use the hose for. If you’re on the move, a longer hose will typically give you more freedom to move around – which is great if you’ll be working in tricky places or at height. If you’ll be working in a garage or shop, a hose that long can be a real pain to store. 100ft of coiled up hose doesn’t exactly tuck itself into a corner, so sticking with shorter versions can make life much easier. Again, whether you want a heavy or light hose depends on what you’ll use the hose for. If you’ll be outside and moving around, you’ll want something light enough to carry with you. If you’ll just be working in one place, heavier hoses tend to kink much less. They’re a lot easier to set them where you want them and forget about them. Lighter hoses tend to move around and kink much easier, so trying to keep them still in a tight space can turn into a bit of a battle. Typically, air hoses come in two diameter sizes – 1/4″ (6.3mm) or 3/8″ (9.5mm). The larger 3/8″ hose carries more compressed air, giving you more power – but you do need a good air compressor to fully make use of it. The smaller 1/4″ hoses are more suited to less powerful tasks, like inflating a tyre or air bed. A good air compressor is able to control the air pressure, meaning you could have both types if you wish – but generally a 3/8″ hose will suit unless you’re certain that you’ll just be performing lighter-pressured tasks. Tools like air hoses are products that no-one ever wants to replace. Making sure that you’re purchasing a product from a well-known and reliable brand is the best way to ensure the longevity of your hose. Good brands often offer the longest warranties and best customer service, too. An indicator of a good product is whether or not the hose is manufactured within the USA. If the company have stuck to producing their product in the US, their returns and customer service centres are likely within the country too. Rubber is the traditional material of a good air hose. Heavy, strong, flexible, and durable – these hoses last for years. Their flexibility and weight make them easy to coil up and store. Considering their weight, rubber hoses are ideal for using in a static location, like a garage or workshop. The heavy weight means that rubber doesn’t kink, and you don’t need to worry about it moving around as you work. Their flexibility also makes them very easy to coil up and store. Just expect a bit of a workout if you’ll want to use a rubber air hose on the move. 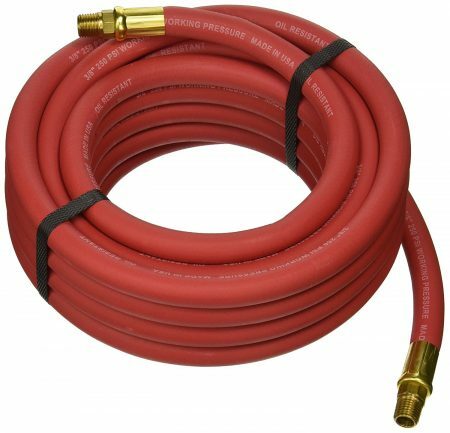 So while they’re not the cheapest, a rubber air hose is great if you’re looking to get a heavy duty, capable air hose that will retain it’s quality for years to come. A rubber air hose is ideal for anyone with a home workshop or working space that needs lasting, reliable quality. They do collect a dirt easily due to being a bit sticky, so we recommend keeping it coiled or held on a mounted roller. We’ve mentioned in the importance of a good brand before – and Goodyear are the undisputed kings of rubber hoses. Use the link below to see Goodyear’s cornerstone air hose on Amazon. It’s hands down one of the best air hoses on the market – rubber or otherwise – and one of the few types still made in the USA. In contrast to rubber, polyurethane is a much newer type of air hose material. Used for a wide variety of products (including packaging foam, sports clothes, and even condoms), polyurethane is extremely elastic, abrasion resistant, and durable. When it comes to hoses, polyurethanes are light, easy to use on the move, and very resistant to abrasion and temperatures. If you’ll be working outside, on the move and in the elements, polyurethane hoses will make your life a lot easier. They’re also fantastic for marine use, being easy to move around and install, without being easy to tear or puncture. However, these chemically-made hoses don’t come cheap. 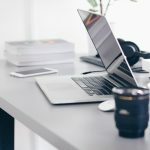 They’re also not the most flexible, either – be ready to fight with a few kinks if you’re working at an angle. Polyurethane is ideal for anyone needing an air hose that’s easy to use on the move: resistant to abrasion, light-weight, and efficient in any temperature. While they can be more expensive, the Amflo 12-25E (pictured above) is a great value polyurethane hose – and is one of Amazon’s bestseller (at the time of writing this). 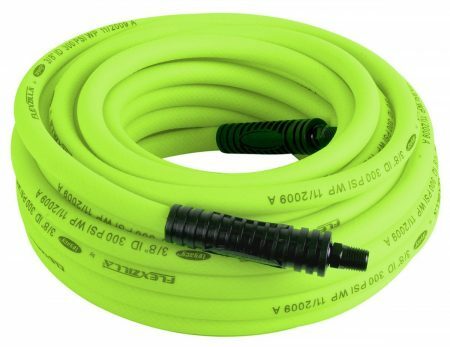 While it’s only available in 25-foot lengths, it’s unbeatable value for money for a hose of this kind. While rubber and polyurethane hoses are quite expensive, PVC is the value-for-money material that generally comes in at the lowest average price. Standing for PolyVinyl Chloride, PVC is the third most-produced synthetic polymer, used in a huge variety of applications and products – including pipes, cables, signs, flooring, and of course, hoses. This cheapness and wide availability means that if a product includes a free air hose, it’s almost certainly going to be PVC. As well as being cheap, PVC hoses also don’t weight much, and are well suited to quick outside jobs or working at height. However, we’d advise using these hoses in cold temperatures as they tend to stiffen up. They also kink fairly easily, too. If you’re just looking for a cheap, good value air hose – PVC is a great option. While these hoses aren’t as durable or temperature resistant as the more expensive materials, sometimes you just don’t need these kinds of properties. For a great example of a PVC hose, check out Campbell Hausfeld’s ‘Heavy Duty’ 50-foot air hose using the link below (it’s the hose that the couple are using in the picture at the top of this post). Hybrid air hoses are a combination of both PVC and rubber – developed to provide the best of both worlds. They give you the low weight and easy manoeuvrability of PVC, but maintain the flexibility of rubber. This provides pretty great kink resistance, but of course it’s not quite the same heavy ruggedness you get with a fully traditional rubber hose. We like to think of hybrids as great all-rounders. 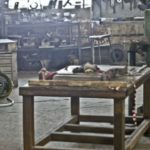 They can perform well in almost any application, from quite cold weather to working at heights, but aren’t as specialised as the individual material types on this list. If you’re just looking for simple air hose solution, hybrid hoses can be a fantastic option. They’re not as effective at individual tasks like rubber is for static working, or PVC is for working on the move, but hybrid hoses can still take on almost any task. The price, of course, is generally an “all-rounder” too. A great hybrid hose option is Flexzilla’s Heavy Duty Hybrid air hose. Not only does it embody all of the good aspects of hybrid hoses, Flexzilla also offer a huge range of lengths, diameters, and end fittings. All of these are included in the link below. Nylon hoses are a bit of a weird one. They’re generally very cheap, and super light weight – the lightest out of any of the hoses on this list. They’re also really easy to naturally coil up, almost like a spring. However, Nylon air hoses about the opposite of durable. Easily punctured and easily kinkable, we really wouldn’t recommend Nylon hoses for general home use. Generally, these types of hoses are generally only used in factories or professional workshops where the hose can be hung from the ceiling. The light weight and easy coiling means that they can be left to dangle and easily grabbed when you need to use them. Unless you’re looking for a hose to fill that specific purpose however, we wouldn’t really recommend a Nylon hose when compared to the other options on this list. 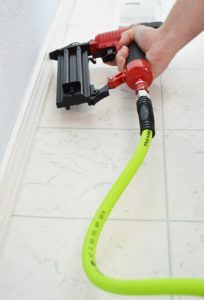 Nylon hoses definitely have their place, but it’s generally only for very specific tasks that involve static working with a wall or ceiling mounted hose. However, if this is what you’re looking for, these light weight hoses are easy to set up and very cheap. A great suggestion to consider is Amflo’s Nylon air hose – linked below. It’s a got everything you can expect from a Nylon hose, and from a well-known manufacturer. With the materials covered, that’s about all there is to know about choosing the best air hose for you. Think about what kind of budget you’re willing to spend, and how long you want the hose to last. 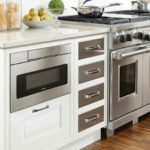 Once you know these three things, you can identify which of the above material types will be best for you. Then, use the initial categories at the top (length, diameter, brand, weight) to refine your selections down to products that meet those conditions. 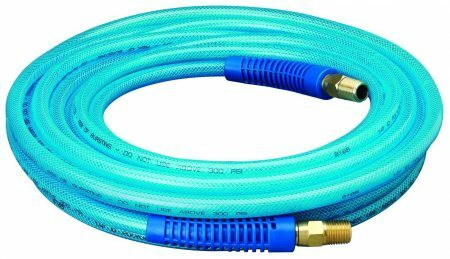 If our individual recommendations for each material didn’t catch your eye, be sure to check out this list of the bestselling air hoses on Amazon. 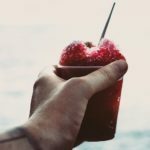 There’s plenty of good options out there, and we hope that you’ll now be able to find the right one for you after reading this guide.